Google will now let you make phone calls from its email service Gmail. As of last night you can call numbers in the the US and Canada for free, with cheap international calls on offer too. Google voice chat pops up with a keypad you dial a number into, and there you are, calling your friend’s phone from your laptop. 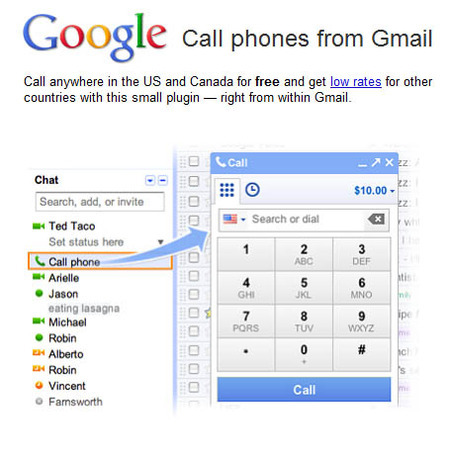 The phone service adds to the much-used gmail-chat and gmail video chat functions that are already available. It copies Skype’s model which allows for free Skype-to-Skype calls and cheap paid-for calls to phones abroad. Google goes one better than Skype by offering free calls to domestic numbers (in the US and Canada only, don’t get too excited). While it moves gmail more firmly into Skype’s terrority, I don’t think the service will either become mainstream or threaten Skype. I still think instant chat is more important in an email-centric situation. I think this service may be useful occasionally, but I don’t think it will go huge. There’s a good service out there already to have video chats on, it’s called Skype and when I go on Skype, I’m in the mood to have video chats. With social networking site Buzz, Google copied an existing successful model – Facebook – and assumed that because people were in their email they would want to go on a social networking site associated with it. They didn’t. Just because this is slightly easier to access, doesn’t mean it’s going to replace Skype which has a great service. I’ll always want to phone my mum, but with a plethora of other ways to communicate they’re not so useful in that you can’t record them or search them or call them up afterwards, and with someone you want to see, I’d prefer a video call. iPhone 4’s Facetime is a bigger threat to Skype because it replicates the face to face wow factor which is still the big draw of Skype. This is by far the dumbest article I have read in this lifetime. Anna, you will be proven wrong. Skype will be bothered, just like Microsoft has, when they found out about the ambition of GOOGLE. SkypeIn numbers have not been available in too many countries, and while Skype is great, the closed nature means that unless Skype says it is OK, you will be at a lack of new features. It won’t be popular until it is free of cost. Next time, Anna tells us why hammers are a thing of the past; doomed to obsolescence by screwdrivers. I think you should save this article just to remind you that you said Skype won’t be bothered. You might be right that face to face is better than phone talk, but Google allows face to face video conferencing. And if you are not near a computer and I can get you on your cell phone is great!! !